Hello! Before I get to my last tee for the week I want to talk briefly about rub-offs. In Monday’s post I mentioned doing a rub off of an existing sweatshirt to generate a pattern for my raglan tee and my sister requested a tutorial for how to do this. There are lots of great tutorials out there but the one that I found really useful was from One Little Minute. I didn’t use the method involving pins when I did my rub-off. I sort of just traced around the pieces using the same general concept of arranging each piece of the shirt flat on tracing paper. I know I would want to be more accurate if I was trying to do a rub-off of something other than a loose fitting t-shirt. A rub off is a great thing to have in your sewing arsenal if you have a ready to wear garment that fits well! And now on to the final day of t-shirt week! 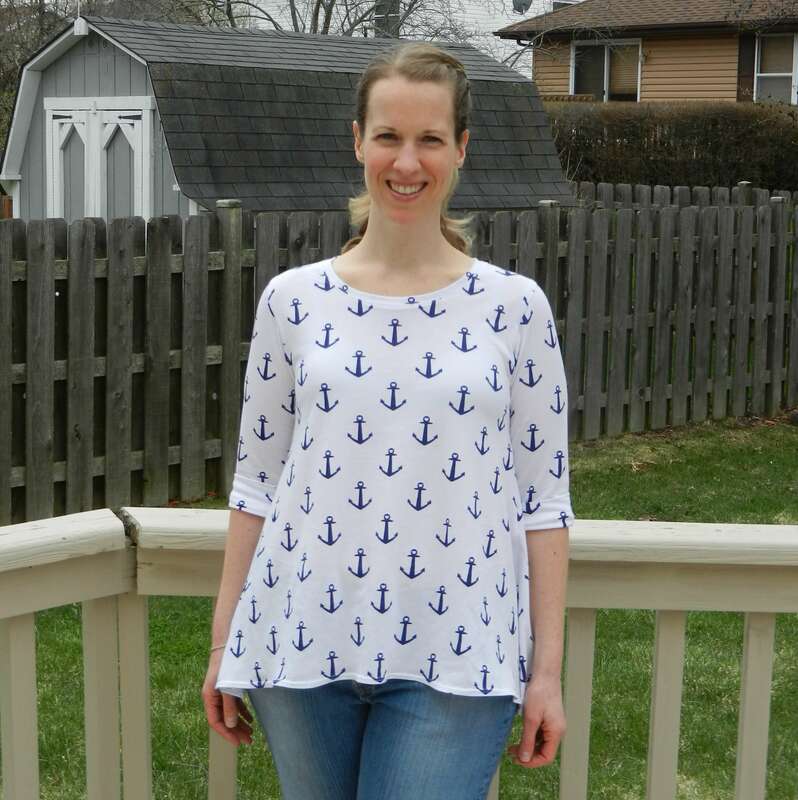 Today’s top is made from another free pattern. This is a modified version of the Deer and Doe Plantain tee. 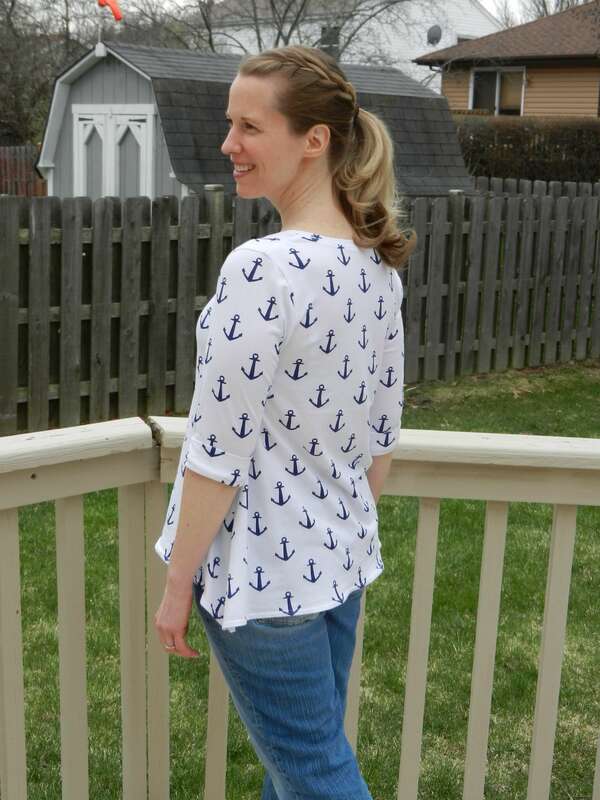 I had some anchor fabric left over from my Day Tripper Top and I was feeling really inspired by this Anthropologie top. I used this tutorial from Grainline Studio to slash and spread the pattern to achieve the swingy look. Instead of starting the spreading across the shoulders I did it starting about 1.5 inches below the armhole. I spread each section by an inch to add 6 inches to the front and 6 inches to the back. The Plantain tee fits me really well through the shoulders so I wanted to retain that… plus I thought if I started spreading too high it would end up looking like a maternity top, which was not the goal. I raised the neckline using my Scout Woven Tee pattern as a guide. (Scout is a fabulous pattern, by the way!) I also modified the sleeves to be elbow length with a cuff, which I love from Sew Caroline’s Out and About Dress. Initially I used the Briar Tee pattern to do a curved hem, but the side seams ended up really long so I modified it to be pretty straight when the hem is pulled out flat. Because it’s swingy the sides naturally ended up being longer toward the side seams. I love how it turned out, especially because it is a fraction of the cost of the Anthro top!